Inspired by true events, this prequel to ﻿Lilac Girls﻿ definitely stands on its own. In 1914, from St. Petersburg to Southampton, NY - Three remarkable women, and their ability to survive revolutions, help immigrants, and stand up for justice, make this a heartbreaking and riveting story of perseverance and love. NEW YORK TIMES BESTSELLER • The million-copy bestseller Lilac Girls introduced the real-life heroine Caroline Ferriday. 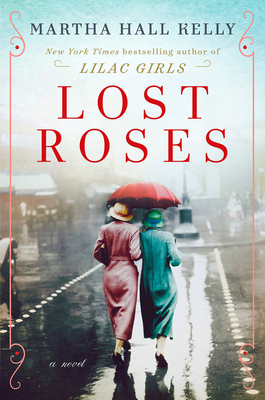 Now Lost Roses, set a generation earlier and also inspired by true events, features Caroline’s mother, Eliza, and follows three equally indomitable women from St. Petersburg to Paris under the shadow of World War I. It is 1914, and the world has been on the brink of war so often, many New Yorkers treat the subject with only passing interest. Eliza Ferriday is thrilled to be traveling to St. Petersburg with Sofya Streshnayva, a cousin of the Romanovs. The two met years ago one summer in Paris and became close confidantes. Now Eliza embarks on the trip of a lifetime, home with Sofya to see the splendors of Russia: the church with the interior covered in jeweled mosaics, the Rembrandts at the tsar’s Winter Palace, the famous ballet. But when Austria declares war on Serbia and Russia’s imperial dynasty begins to fall, Eliza escapes back to America, while Sofya and her family flee to their country estate. In need of domestic help, they hire the local fortune-teller’s daughter, Varinka, unknowingly bringing intense danger into their household. On the other side of the Atlantic, Eliza is doing her part to help the White Russian families find safety as they escape the revolution. But when Sofya’s letters suddenly stop coming, she fears the worst for her best friend. From the turbulent streets of St. Petersburg and aristocratic countryside estates to the avenues of Paris where a society of fallen Russian émigrés live to the mansions of Long Island, the lives of Eliza, Sofya, and Varinka will intersect in profound ways. In her newest powerful tale told through female-driven perspectives, Martha Hall Kelly celebrates the unbreakable bonds of women’s friendship, especially during the darkest days of history. Martha Hall Kelly is the New York Times bestselling author of Lilac Girls. She lives in Connecticut, where she spends her days filling legal pads with stories and reading World War II books. Lost Roses is her second novel.